Melissa McCarthy climbed to the top of the World Irish Dancing Championship podium Tuesday with the quiet confidence of the young lady who won her first North American National Irish Dancing Championships in 2011! The 15 year-old from Harney Academy in Massachusetts beat 2012 All-Ireland and 2010 and 2011 World Irish Dancing Champion Ann Paige Turilli from New York in the Girls 15-16 competition at Belfast's Waterfront. McCarthy is also an eight-time New England Regional Irish Dancing Champion, having competed twice in the under 8 event. Turilli, the 2012 All-Ireland and 2010 and 2011 World Irish Dancing Champion, placed second. Mackenzie Mahler, from the Blakey School in Western Canada rounded out the Top Three. So far, this is the only competition at Worlds that has seen three North Americans in the Top Three! with friends Tayler Nunes and Grace Schiller from Harney Academy. Liam Harney, TCRG, ADCRG, was overjoyed with his Irish dance student's win and to the delight of his friends and fans, performed a little victory dance on stage. Harney himself is a two-time World Irish Dancing Champion, having won the Junior Men's event in 1984 and the Senior Men's event in 1987. Harney said, "I always knew I would be happy to have a student win the Worlds but I had no idea that I would be this happy. I have been hit with a wave of proud and happy emotions that seem to be with me each day when I wake up! It's true, she did it! Melissa actually did it! She's a World Champion!" World Champion teacher and student! According to Harney Academy, "It is Liam's dynamic style and positive attitude that has propelled the students of the Academy into world-class distinction. His personal commitment and spirited personality invigorate and fuel the schools' dance programs. His skills as a choreographer coupled with his extensive performing arts background transcend the school and immerse students [with] progressive and traditional dance numbers." Melissa McCarthy is grateful to her teachers Liam and Sally Harney, with whom she has been dancing since age four. She says, ""It was just so amazing and I couldn't have done it without the help and support of my teachers and friends! I was so glad to be up there with my two other North American girls... all the girls up there are amazing!" Stay tuned for the next installment... more articles and results every day here on Go Feis! 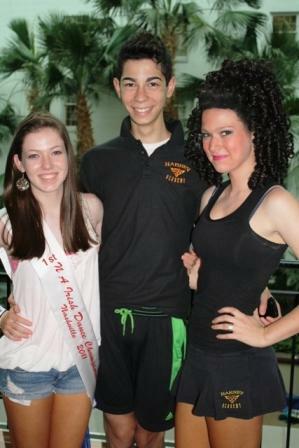 The Irish Dance Blog! Follow daily commentary on Feis America's Facebook page for up to the moment World Irish Dancing Championships results and progress.